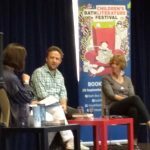 For the 11th year in a row my September has been highlighted by the BathKidsLitFest. Every year I get this in the diary and know that I will be stewarding for some fantastic authors and illustrators over the 10 days of the Festival. 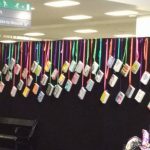 this time was no different and I managed to pack my diary with events over both weekends. 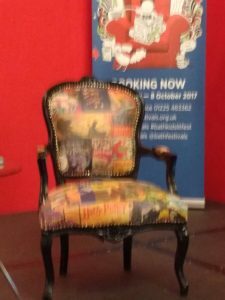 The festival started on the evening of 29th September when I found myself stewarding for a Cressida Cowell event at the Forum in Bath. There must have been about 6-800 in the audience and as usual Cressida gave an amazing session, talking about both her “How to train your Dragon” series but also about her new book “The Wizards of Once” The session was highlighted by photos drawings and clips from the latest dragon film. All in all it was a great event and the audience were delighted. The signing queue was long and must have lasted nearly 2 hours, which meant that I missed most of the launch party; luckily several of my friends were still there, so we were able to have a catch up chat. Saturday started with the David Baddiel session, talking about his new book “Birthday Boy” but also about some of his earlier works, like “The Person Controller” and “The Parent Agency”As he is a polished comedian and entertainer I was expecting a funny and well put together performance and I was not disappointed. 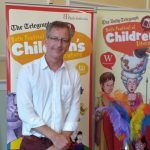 He spoke about his inspiration for the stories and really promoted the need for children to read for pleasure. Once again he had a large and very attentive audience and it was good to see the mix of boys and girls, although especially good to see so many boys. The next session was one for my grandson, or rather it will be at Christmas! 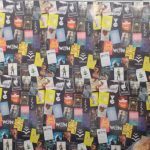 This event “Star Wars with JAKe” was aimed at a slightly younger age group, but really it was for anyone who loves Star Wars. Of course with the new film coming out soon this was just the thing to whet people’s appetites. JAKe is the illustrator of two small books called “How to speak Wookiee” and “How to speak Droid with R2-D2. 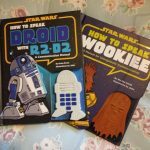 They are simple stories explaining about Wookies and Droids and giving insights into their respective languages. Each page has a number and the book has a keypad, so that you can hear the sounds associated with that page by pressing the correct key. 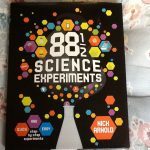 Very interactive and great fun (but not necessarily for parents or grandparents!). The children got the chance to draw a variety of characters from the films and some very lucky people got to take one of JAKe’s illustrations home. It was a lovely family event that the audience really enjoyed. My next day at the festival was Sunday the 1st October and unusually I did the afternoon session rather than the morning. this was because I wanted to listen to two exciting and fascinating authors in conversation. 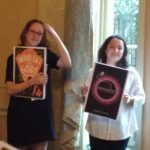 They are Emma Carroll, author of “Letters from the Lighthouse” and Eloise Williams who has just published her first book “Gaslight“. 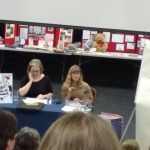 The Session was described as “The History girls” and both authors have placed their books in the past, although in widely different places and times. Emma has written about World War II although previously she has set her books in the Victorian period and this has enabled her to bring in a range of dangers and differing characters. Eloise has set her book in Victorian Cardiff and has centred the story around a theatre and the docks, o there is again plenty of opportunity for mystery and villainy. 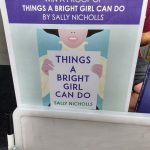 A really great time for all of those, especially young girls who love a great historical novel. 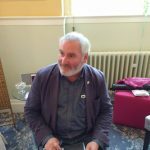 I was also lucky enough to meet Chris Riddell in the Green Room as he was preparing for his talk later in the day. I know that the audience would have had a truly amazing time as he is such a brilliant speaker and artist. We were so lucky to have him as a Children’s laureate and he is now an ambassador for Booktrust. 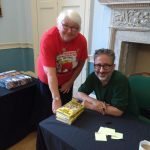 The day was further improved by seeing the lovely talented Martin Brown in the Green Room as he had just finished his event on illustrating the “Horrible Histories” series; his covers and ink sketches really are the icing on the cake as far as these books are concerned. 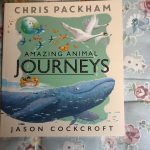 He has also just produced a book about unusual animals that I talked about in my post from the Federation of Children’s Book groups this year, absolutely brilliant. Having had a few days off, Friday 6th saw me back in action stewarding for the Nadiya Hussain event. 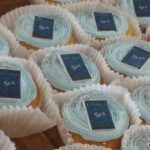 She was promoting a book which mixed food and stories all linked in to the theme of Christmas, called “Bake me a Festive Story”. She got several children to come on stage to help decorate gingerbread Christmas trees with green coconut and this was put on to large screens behind her. There were also readings of at least one of the stories and it was a shame that they appeared to have been pre-recorded. However the audience, both adults and children appeared to enjoy the event and were eager to get their hands on copies of her books. 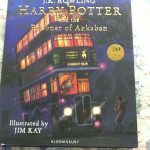 I stayed on at the Guildhall for the following event, which was the brilliant illustrator/artist Jim Kay, whose illustrated ‘HP and the Prisoner of Azkaban’ has just been released. It is truly amazing how he has taken the world created by J K Rowling and has added depth and reality to an already beautifully realized world. 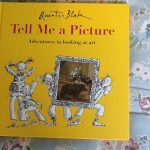 The insight that we were given into the whole process was enlightening and the fact that the illustrations for the first book took him over two years to produce had the audience gasping. 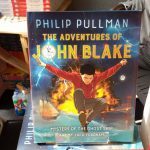 When he went on to say that he had been given a deadline of eight months for the second book, it made most of us cringe at the concentration and focus that was required. We were then treated to some amazing drafts for pages from the current book and Jim talked through the process of how the final images evolved. It really was a must see event for those who love Harry Potter as well as those who just love high quality illustration and imagination. My Saturday morning was a mix of very different books, but I enjoyed both events because the speakers were so enthusiastic about their subject. 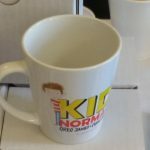 The first event was about the book “Kid Normal“, written by Radio 1 DJs Greg James and Chris Smith. The book is about a young boy who accidentally finds himself at a school for superheroes, despite having no superpowers. I must admit that I enjoyed reading the book and am looking forward to the follow up which is coming out in March 2018. 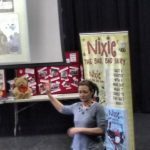 The presenters were fun and very positive about children and reading; it was obvious that the audience really enjoyed the whole session and that included the suspiciously large number of lone adults who attended. On Sunday morning it was difficult to believe that this was the end of the festival. We spend months looking forward to it and then it just goes in a flash. My final day was spent at a different venue, the Widcombe Social Club, which although smaller than the Guildhall had a very friendly feel, as well as very good coffee from the bar. I was scheduled to steward on two events and they were ones that I was really looking forward to. 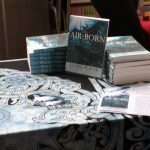 The first session was a discussion between Gill Lewis, author of “Sky Dancer” and Kieran Larwood who has written two books about the eponymous hero rabbit “Podkin One-Ear” It was a fascinating look at the difference in their styles of writing. 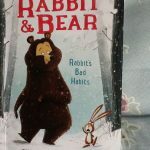 Gill very much keeps her books grounded in the real world and the creatures are not humanized in any way, yet we are able to make a connection with the animals and their worlds. Kieran, on the other hand, has created a world that is inhabited by speaking, clothes wearing and almost human rabbits. There is a mix of magic and fantasy but still they retain their link to the natural world they live in. It was fascinating to hear both authors explain how they went about creating their stories and I would recommend that readers give both of them a try; they are well worth reading. My final session was with one of my favourite authors for the MG (Middle Grade) reader. Robin Stevens has made a name for herself as the author of the “Murder Most Unladylike” series and all her fans are eagerly awaiting the sixth in the series, which will be published in the early spring. I understand that she has already started writing number seven, so everyone is happy. 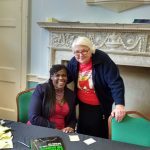 However at this event she was talking about something very different.She has been chosen to write the follow up to the “London Eye Mystery”by the late Siobhan Dowd. 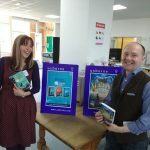 Her book “The Guggenheim Mystery” has just been published and it was fascinating for the young readers to find out about the challenges of taking over the characters and plot conceived by such a loved author. Whilst the main characters are the same as before, the story is set in the United States and this gives problems to the young hero and his friends as they do not understand the culture. The fans were eager to ask questions and most stayed to have their book collections signed by the author. The day was rounded off by saying hello to the lovely and brilliant writers Kevin Crossley- Holland and Francesca Simon who were preparing for their discussion about “Norse Myths”; a topic about which they are both very knowledgeable and enthusiastic about. It is great to see how myths and legends seem to be coming back in to favour and there are so many great versions and variations that you can look out for. Well that brings me to the end of my Bath for this year. As always it was stimulating, educational and above all a very friendly festival. I love the range of events and look forward to volunteering for my twelfth year in 2018. A Harry Potter themed Chair! This summer has been a real mix of weather and there have been many occasions when the best idea is to just curl up with a good book and a hot drink, however as I am finishing this post over the holiday weekend the sun has come out and reading starts to be enjoyable in the garden. This has meant that I have managed to read more than my usual quota of books over the last month or so. A few of them are review copies for journals and I have to admit that they have all been ones I enjoyed reading; not something that I take for granted. “The Polar Bear Explorers’ Club” by Alex Bell is a magical tale, set in an unreal world with Unicorns, miniature penguins and man-eating cabbages to name just a few of the weird and wonderful characters. Stella Starflake Pearl, the heroine, has been brought up by her guardian since he found her as a baby. He is a member of the Polar Bear Explorers’ Club and Stella dreams of joining him in his travels, but girls are not allowed to be explorers. How she overcomes this challenge, fights a range of dangers and finds out about the mystery of her own birth makes for a really exciting and action packed story. There is magic and adventure as well as messages about what family really means and the importance of friendship. I was completely hooked by this story and am really looking forward to the next book about Stella and her friends. “Greta Zargo and the Death Robots from Outer Space” by A.F. Harrold, illustrated by Joe Todd Stanton. I was lucky enough to hear this author/poet speak at a conference earlier this year, so I was excited to see what this story would be like. 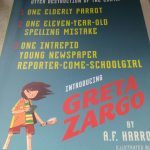 Well, it was just as hysterically funny as you might imagine with a very determined heroine Greta Zargo, who really wants to be an investigative reporter. 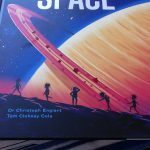 There is the case of the missing cakes and the competition to win a reporting prize but in the background and moving ever closer to Earth is a Death Robot; can Greta find the culprit and save the planet at the same time. You will have to read it to see. 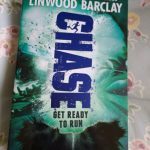 “Chase” by Linwood Barclay is the first story for children by a well known writer of detective novels. He has given us a mystery with two main central characters. Their stories start individually but gradually things begin to merge until eventually we understand how they are linked together. Chipper is a dog that has been kept in a scientific research facility since he was young. He knows that the ‘white coats’ have done things to him, but his increased abilities allow him to escape and go on the hunt for someone (unknown) that he just has to find. On the other side of the State lives Jeff, who has gone to live with his aunt after the tragic deaths of his parents. How these two come together and what their connection is makes for a thrilling and very addictive story. The next in the series should be a real roller-coaster I suspect. One for years 6 and 7. 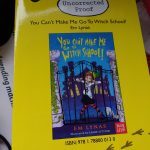 “You can’t make me go to Witch School” by Em Lynas. Daisy Wart just wants to become a great Shakespearean actress but her grandmother insists that she is a witch and sends her off to witch school. Despite her protests she finds that she can do magic and she and her new friends are called upon to save Toadspit Towers (her school) from an ancient curse. can she do this and also achieve her acting ambitions? This is a funny and exciting story about finding yourself and also about friendship. It is great for the lower end of KS2 and those who just want a light and very enjoyable story. 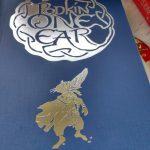 “Podkin One ear” by Kieran Larwood brings back memories of stories by both Brian Jacques and Robin Jarvis, which means that perhaps I am showing my age to some extent. 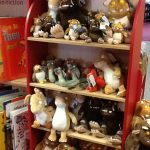 It is a fantasy with rabbits as the main characters, so there is also a nod to Richard Adams and ‘Watership Down’. They are anthropomorphized, so that we are taken to a somewhat medieval landscape with warring tribes and three young rabbits who are fleeing from a terrifying enemy and who have to save an ancient treasure. It is a thrilling story for ‘middle grade’ children and could well be a favourite for many years to come. 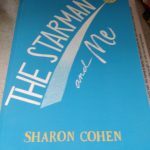 “The Starman and me” by Sharon Cohen (NG) reminded me somewhat of ‘Stig of the Dump‘by Clive King, ‘Nation‘ by Terry Pratchett and another new book by Adam Stower called ‘King Coo’. When Kofi sees an unusual small and very scruffy person on a roundabout he is in for the most amazing adventure of his life so far. The character finally makes contact, but is he from our world and if so, how did he get to England? this is one of those books that gradually hooks you and then reels you in. A really great read. “Hospital High” by Mimi Thebo (NG). this is a book for teens and is very personal to the author as it is based on a true story. It is the story of Coco, who ends up in hospital after a car accident, where she suffers internal injuries including crushing her voice box. The ensuing months and years follow her struggles to regain her health, but also to see how her relationships with family and friends pan out. It is a totally uplifting tale that I will probably read again and would definitely recommend to other adults as well as to the intended audience. “School for Skylarks” by Sam Angus (NG) follows the story of Lyla who is evacuated to live with her Great Aunt at the end of 1939. She does not want to leave her mother and hates her father for splitting them up. This is a real roller coaster of a story; the heroine is not one we naturally find sympathetic but over the war years we follow her as she gradually matures, both emotionally and intellectually. More by accident than design Lyla finds that a small girls’ school is billeted in the big house and she learns how to work with others and gradually make friends. It is such an heartbreaking story at times, but eventually we get a satisfying end that works well. This is definitely an author to look out for. “Ban this book” by Alan Gratz (NG) is a thoroughly thought provoking story of what happens when Amy Anne’s favourite book is banned from the school library. For those of us who have been around for a long time it will bring back memories of “The day they came to arrest the book” by Nat Hentoff. The situation in America is very different and they even have an annual ‘Banned Books Week’, so that people can stand up for their right to read what they like. If you look on the American Library Association website you will see the list of hose books which have been challenged over the years, you can find it here http://www.ala.org/advocacy/bbooks/banned . “The Escape from Mr Lemoncello’s Library” by Chris Grabenstein (NG) is an exciting story of a group of children who win the change to have a sleepover at the amazing Mr Lemoncello’s Library. It is a place of wonder and mixes science with magic so it is not surprising when the challenge becomes harder and the young people have to learn how to work as a team in order to escape from the ‘lockdown scenario’ they find themselves in. It is a great story and I am looking forward to reading the two other stories featuring the library. Looking at this group of books I think I have been very lucky with the titles that I have been given access to recently. The range of subjects is wide ranging and the age groups are also wide. 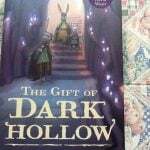 There is everything from high fantasy to the really heart rending stories based on real life. Hopefully there is something for everyone, so dip in and give some of them a try. (NG) Thanks to Net Galley for providing access to a digital proof in return for a review. 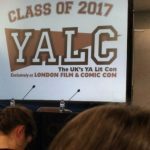 This definitely seems to be my year for having new book related experiences and yesterday I finally attended the Young Adult Literature Convention (YALC) which is now in its 5th year. It is part of the London Film and Comic Con, so there were a lot of people walking around wearing the most amazing and often weird costumes. We had Star Wars, Star Trek, Dr Who, Steam Punk, as well as others that I cannot guess at. However, it was brilliant to see so many enthusiastic and committed fans, all of whom seemed keen to let the world share in their passion. YALC had its own area on the 2nd floor, so that it was a self contained unit. 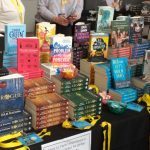 Lots of out favourite YA publishers were there and there were plenty of freebies (in the guise of bookmarks, postcards and even book chapters), some proofs (all gone by the time I arrived) and books at generously reduced prices. The whole set up was very well organized with a ‘room’ for workshops, a large ‘room’ for talks/panels and masses of space for author signing sessions. It is difficult to describe the ‘buzz’ that was going on all day, but it was fantastic to see so many young (and not so young) people who obviously love reading these books. Having said all of this I did not feel that the hall was crowded; after seeing tweets from the following two days I am convinced that they were the busiest days. On the plus side it meant that the queues were not too long and people were able to talk to their favourite authors as they enjoyed the activities. I had marked up two panel events that I really wanted to attend and they did not disappoint in any way. 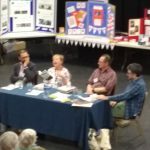 The first was a discussion about Historical Fiction, something that has been seen as “rather boring” by many in the YA world and yet the panel were totally convinced of the opposite. 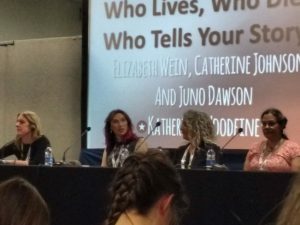 The chair of the panel was Katherine Woodfine and the members were Juno Dawson, Catherine Johnson and Elizabeth Wein, all of them at the forefront of YA writing today. 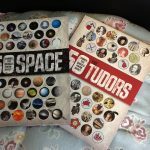 Their motivation for writing about the past differed, with Elizabeth being inspired to write about young women pilots after she gained her own Private Pilot’s Licence, Catherine wanted to read about people like herself (people of colour) and Juno wanted to look at the lives of LGBT young people in the past. The panel spoke about how they went about the process of writing and specifically about the type of research they undertook. I was particularly impressed by Elizabeth Wein who went “Wing Walking” as part of her research! the panel also discussed what we learn from history and how we need to be skeptical about what we read as history is often ‘whitewashed’. they all have their favourite suggestions for getting the ‘feel’ of the book correct; this includes reading period books to get the language right, Pathe newsreels to hear the voices and see the clothes and early films. Just as with Sci-Fi and Fantasy it is vital that the world building is accurate and feels right to the reader. I found that I had time before my final session so I treated myself to a panel talking about writing “Thrillers”. 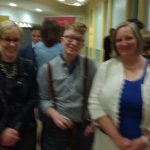 the panel was a large and well respected one including Sophie McKenzie, Teri Terry, Matthew Crow, Karen M McManus and Emily Barr. 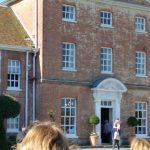 there was a long discussion about what people used as their main focus; for some it was about the place and going somewhere very different, whilst others tended to use locations that they were very familiar with and which the readers learn to relate to. Everyone agreed about the vital importance of characterization with “People in conflict with others and themselves”. The readers are often in the 12-14 age group and they are also going through great changes in their lives. Overall this was a very stimulating session which I thoroughly enjoyed. 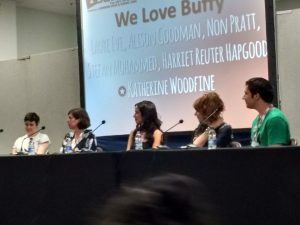 My final session was one that I thought might teach me something about a TV series that I only seemed to watch the trailers for, it was called “We love Buffy” and was for real aficionados of “Buffy the Vampire Slayer. I was totally amazed by the knowledge that these people had about the show. They knew the names of the episodes, the characters, the songs; it was incredible. 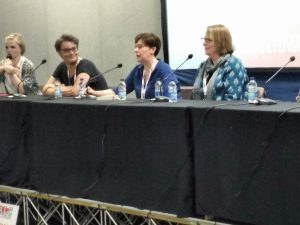 The panel consisted of Katherine Woodfine, Laure Eve, Alison Goodman, Non Pratt, Harriet Reuter Hapgood and Stefan Mohammed and their experience of the series was quite wide ranging, in line with the variations in their ages. Some had watched as children and teens, whilst others had been adults. This meant that their understanding and fear levels were very variable, but they had all been totally sucked into the series and till had that enthusiasm that denotes a true fan. Everyone had their favourite characters, although whenever someone else was mentioned you could hear the mental re-assessment ; however they did agree that “Giles is the world’s coolest librarian” and who am I to disagree with that. 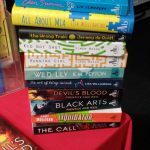 This had proved to be a fantastic experience meeting friends, listening to fantastic authors and generally wallowing in the world of YA books. I definitely feel that I will be back next year and maybe I will include the Saturday as it seemed fabulous on Twitter. Meanwhile I have a lot of reading to catch up on ready for the next set of blog posts on a wide range of books. 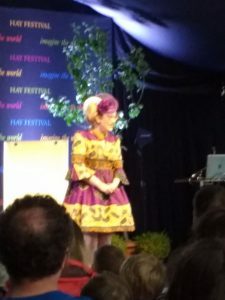 Well I have finally achieved an ambition that I have had for many years – my first visit to the Hay festival; however it will not be my last visit I am sure. For those who have never attended, I hope I can give you just a small flavour of this quite extraordinary and very unique event. 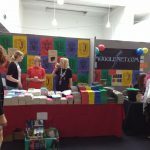 It takes place over two weekends (from 25th May to 1st June in 2017) and is a melting pot of events covering adult and children’s, non-fiction and fiction. 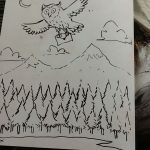 there are politicians, artists, reporters, authors and illustrators all expressing a wide range of views, so that almost everyone will find something to their liking. Everything that I know about the Festival has been learnt from friends who have appeared or attended in past years. Hay itself is a small town with the reputation of being the second-hand bookshop capital of the country (if not the world). During the festival period it becomes overwhelmed by the number of visitors and accommodation is extremely difficult to find. For those who are young enough and have the energy there is always the option of camping or glamping; however hotels and B&B s need to be booked a long time ahead if you want to be anywhere near the town. This year I only attended for one day so my main concern was in finding parking. Luckily this is extremely well organized with a large off site car park several miles away at Clyro Court. the cost was £6.00 for the day but this also covered the bus to and from the venue. The buses are every 10 minutes and run until after all of the events have finished, so quite late in the evening. However I also found that there are several large “Charity” car parks just outside the entrance to the site, so this is something that I need to investigate for the future. The day that I chose to attend was Monday 29th, mainly because Neil Gaiman was going to be ‘in conversation’ with Stephen Fry. As my friends know I was lucky enough to be chair of judges in 2010 when Neil won the Carnegie Medal for “The Graveyard Book” (illustrated by Chris Riddell). 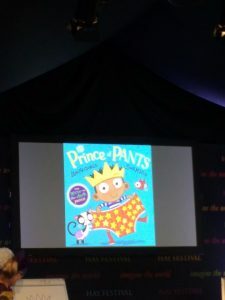 I also discovered that Sarah McIntyre was talking about her new picture book “Prince of Pants” (author Alan MacDonald) and Philip Reeve was discussing “Black Light Express” the follow up to “Railhead”. I booked all of my tickets, including the parking many weeks before the date and was ready for the two hour journey when the big day arrived. I knew that it was going to be good when I saw three people that I know within five minutes of arrival at the site; there is nothing like the feeling of belonging this can give you and the children’s book community is so open and friendly that it feels like seeing members of your family . The Festival site is like a miniature city under canvas with a variety of tents connected by wide covered walkways. This means that even in the rain it is a very usable space. The first thing that really hit me was just how crowded the venue was. With other Festivals such as Bath and Cheltenham they are widely spread out, but this is something totally different. However it gives Hay a really sense of energy and excitement and you gradually get used to the crowds. The tent city is well signposted and there are plenty of places to chill out, get something to eat and drink and generally enjoy the ambiance. My first stop was the Festival Bookshop where all the signings were taking place. there were several queues and it took a while to understand what was going on; however there is a board which tells you that each doorway is allocated to a specific signing queue, but some of them were very long and things became confusing. My first event was Sarah McIntyre who was sporting another one of her fabulous outfits, both dress and hats; however it was the beautiful handmade bead necklace that had me drooling, the maker is obviously extremely talented. As always Sarah got her audience to draw some of the characters from the book and also explained the whole process of creating the illustrations. I think many were in awe of the skill that goes into interpreting the words that are given to an illustrator and it reminds us that the illustrators are of equal importance (Hence Sarah’s work on http://www.jabberworks.co.uk/pictures-mean-business/. I then wandered over to the tent where Philip Reeve was talking about his new book. He had some great digital book trailers which had been manipulated to give the feel of being in space. 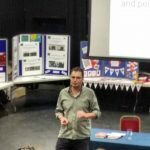 Philip is an amazing speaker and he had his audience totally enthralled. Just before the talk started I discovered that the lovely M G Leonard was sitting directly in front of me, so we were able to renew our acquaintance. You really must read her two books “Beetle Boy” and “Beetle Queen” if you have not done so already. After the event had finished I was able to spend some time talking to Sarah and M G before going in for the Neil Gaiman event. 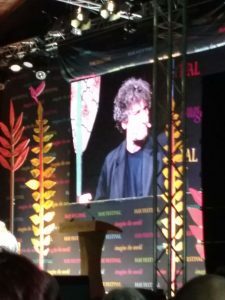 Stephen Fry and Neil Gaiman were discussing his new work “Norse Mythology” and making links to Greek Mythology, as Stephen Fry is currently working on this theme. 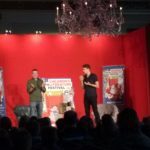 This was a highly motivated audience of hard-core fans and they were even more ecstatic when Chris Riddell joined the others on stage and spent the entire session creating wonderful and very humorous sketches based on the conversation. The event was a masterclass in illustration, interviewing and also the depth of knowledge that both speakers had about their subjects. Although I had taken several books to get them signed the queue was far too long and I still had a two hour drive. 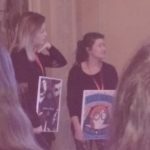 Still I hope that I will be able to hear Neil Gaiman speak at another event in the future. 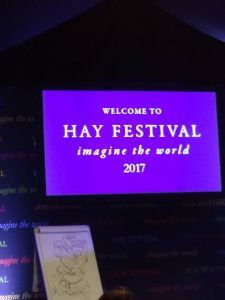 Hay Festival turned out to be a real delight and I am hoping that in future years I will be able to go for several days and totally wallow in the experience. It also shows that reading is still alive and well in this country and the range of material is absolutely huge. I really do encourage people to go to this if they can, however it does require a fair amount of planning to maximize the benefits and see as many people as you want to. I am sure that many of the events were sold out, so it is important to book tickets as soon as you can; trying to get tickets on the day will probably not work. Thank you to everyone involved with the Festival, you are fantastic. 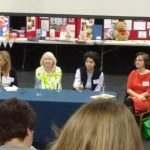 The FCBG annual conference is organized by local groups and this year it was the turn of Reading to host the event. The venue was the Oratory School, a rather amazing old boarding school near Reading, set in beautifully manicured grounds. The downside was that, like most schools, we had to share loos and showers, but the communal areas in each block were great places to sit and chat about books. 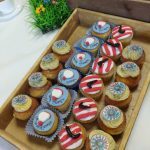 We all arrived on Friday afternoon and over tea and cakes we had the opening of the exhibition and then short talks from Claire Barker (author of Knitbone Pepper) and Andrew Beasley, who was introducing his new series called S.C.R.E.A.M. 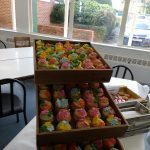 We were also tempted by the first of the cakes, something that is of vital importance at all book conferences. Pre-dinner drinks were hosted by Bounce Marketing who are celebrating their 15th anniversary this year. This was held in the school library and I can’t be the only person who wanted to start an audit of the school’s stock; I think it is part of being a librarian. The highlights of the evening were to follow and we really were spoilt. 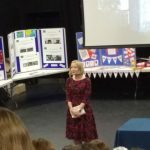 The first after dinner speaker was the historian Lucy Worsley who was talking about the two books she has written “Eliza Rose” and “I am Victoria”. She linked these to her job at the Historic Royal Palaces and showed some beautiful slides of the buildings. She also spoke about how she had been enthused by writers such as Jean Plaidy and hoped that her book would have a similar effect today. Lucy was a charming, articulate and very knowledgeable speaker with a great sense of humour. 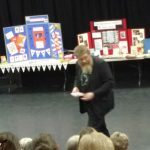 The second speaker was the poet A.F.Harrold who had us in stitches with some of his poetry, but also had something to say about children and reading. 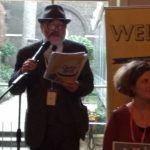 His rendition of this poem http://childrenspoetryarchive.org/poem/minister-exams had many of us nodding in agreement with the words that Brian Patten has written. Saturday was a packed schedule and started with Jon Walter, an author whose work I have not read. He was an excellent speaker and really engaged with the audience. He writes for a teen audience and I think I will have to give his work a try. We then had a panel event with D.J. Brazier (“Alone”)and Caighlan Smith (“Children of Icarus”) in conversation with Daniel Hahn. They discussed how they had become writers and what the influences were on their stories. The next session, following a much needed coffee break, was one about books in translation, which again was led by Daniel Hahn. 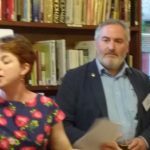 It was a fascinating insight in to the problems facing publishers and translators and it also highlighted the new guide from the SLA which has been written by Daniel and his co-author Joy Court (also on the panel). The morning’s events were concluded by a session by G.R.Gremin, the author of “Cowgirl” and the lovely “Sweet Pizza”, which reflects his experience of being Welsh with an Italian heritage. The afternoon started off with a set of workshop sessions. Unfortunately we were only able to attend one, so I chose the entertaining and knowledgeable Bev Humphries who was discussing “Digital Storytelling”. As always she challenged us to think in different ways and showed us resources that we had not come across before. 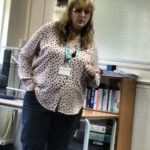 She also very helpfully gave us links to all of her presentation. We then had a session with the super talented Martin Brown who talked about his work, especially his new book “Lesser Spotted Animals”. This covered some amazing, but relatively unknown animals and we all fell in love with the ‘black hooded ferret’. 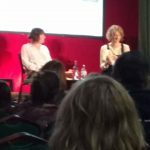 The final session was the wonderful Wendy Cooling in conversation with Kes Gray (“Oi Dog”) and Rachel Bright (“Love Monster”), two of our outstanding crop of picture book writers at the moment. 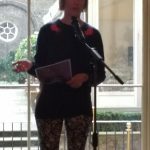 The evening was outstanding with pre-dinner entertainment from Jo Cotterill (“A library of lemons”); this took the form of a quiz and revolved around the theme of strawberries in reference to her next book “A storm of strawberries”, which comes out at the end of June. The score was kept by Chris Riddell and the finale was dressing up someone (from each team)as a strawberry, so it was a great fun event. The after dinner speech was from Chris and he spoke about his time as Laureate and the importance of reading, books, libraries and librarians. 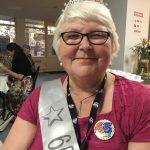 Saturday was also special because it was my 65th birthday. I don’t usually make a big fuss about birthdays but I must have mentioned it to the wonderful Bev Humphrey in the past. 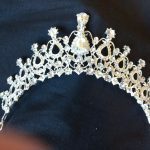 So at breakfast I was presented with a sash and badge, a lovely “Elder wand” pendant and a tiara (to be worn in the evening). 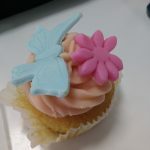 It was so totally lovely and unexpected and really made my day. 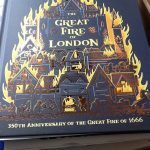 For the rest of the day people kept coming up and wishing me a “Happy Birthday” and in the evening I got a mention from the fabulous Chris Riddell. All of this made me realize what an amazing community I belong to in the children’s book world. So thank you to all my friends who made it such a memorable day and especially to Bev for all her hard work. Sunday morning came around too quickly but the standard of session was just as high as on previous days. 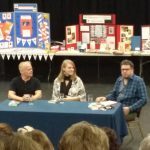 We started with a panel event, with publishers from Alanna Books, Book Island and Tiny Owl talking about the difficulties but also the opportunities that they found in setting up a small company. 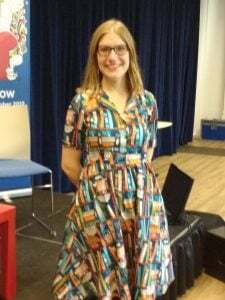 We then had Emma Shoard talking about the new edition of “The Pavee and the Buffer Girl” by Siobhan Dowd, for which she has provided the stunning illustrations. 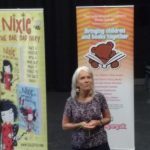 Cas Lester then spoke about her books for younger readers (“Nixie, the bad, bad fairy”)and how her previous life as a BBC producer of programmes such as Jackanory had strengthened her conviction on how important storytelling and books are to children. It was fascinating to hear about the TV life, but also to see how that has been translated into writing her own books. The final offering was a joint session by Nicola Davies and Petr Horacek speaking about their work “A first book of Animals”. Petr produced some spectacular art work whilst Nicola gave us the expert’s view of the animals. What an excellent conference and a big thank you has to go to the organizers and also the publishers and other delegates for making this such an enjoyable experience. 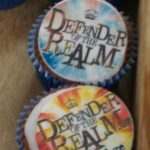 It really is perfect for all of us who love children’s books and want to promote them to their intended audience and yes, there was CAKE, in abundance. 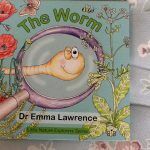 I know that this is a really odd title for a blog post but I think it reflects the sensation when children first discover that they can read longer books with pleasure and a certain degree of fluency. It is like learning to walk, ride a bike or even to swim; there is a feeling of freedom and having some control over the environment in which you find yourself. In other words it is a truly liberating experience which will stay with you for your whole life. 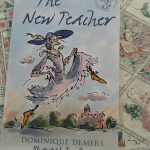 “The New Teacher” by Dominique Demers and Tony Ross is the first in a series of books by this French Canadian author and which was first published in 1994. It is a short and very witty story about what happens when Miss Charlotte arrives to teach a class of young children who do not enjoy school. Her somewhat eccentric methods eventually make her very popular, but the children find that they have to fight to keep the teacher they have come to love and admire. As a follow on, you might like to read “The Mysterious Librarian” which sees Miss Charlotte take on the challenge of encouraging children to enjoy reading. 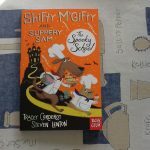 “The Spooky School” by Tracey Corderoy and Steve Lenton is another set of short stories about the cake-baking, crime-fighting duo of Shifty McGifty and Slippery Sam. 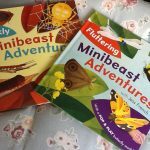 They originally started their adventures in picture book format but have now branched out for the next age group. In this book they save jewels, fight ghosts and meet a fiendish new villain; a Red Panda called ‘Red Rocket’. It is great fun. 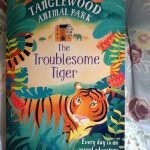 Tamsyn Murray has written “The Troublesome Tiger” as the second story in the “Tanglewood Animal Park” series which follows the adventures of young Zoe, whose parents have bought Tanglewood Manor and turned it into an Animal Park. This story revolves around Tindu the male Tiger and the attempts to help him settle down in the park, before the arrival of his new mate. It is a charming story with a lot of information and a cast of characters that you can’t help but like. This is a super series, especially if you are an animal lover. 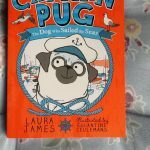 “Captain Pug” by Laura James and Eglantine Ceulemans follows the adventures of young Lady Miranda and her dog called Pug as they visit the local boating lake. However when things get out of control and Pug finds himself in the sea and being rescued by another young girl life becomes quite adventurous. This is the first in a series of adventures for the pampered pooch and joins the list of books written about the breed. 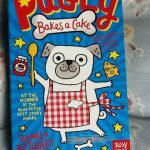 “Pugly bakes a cake” by Pamela Butchart and Gemma Correll is another Pug related story only this time the hero is called Pugly and he is trying to bake a cake for his owner. Unfortunately his efforts seem to be being sabotaged by Clementine (Clem) the family cat. Most families with a mix of pets will understand the frictions between the main characters and the very funny scrapes that they get themselves in to. 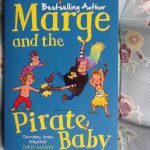 “Marge and the Pirate baby” by Isla Fisher is the second book featuring Marge, a truly unique babysitter. This time she is looking after Jemima and Jake as usual, but finds herself having to look after their demon of a baby cousin called Zara. There are three short stories in this offering and I think that the author is really starting to be comfortable with her characters, which means that we become more involved with the stories. 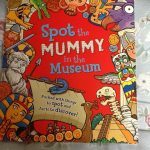 This is a funny and quirky book for both boys and girls. 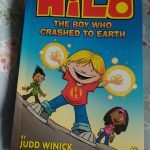 “HILO, the boy who crashed to earth” by Judd Winnick. What do you do when you discover a boy that says he fell from the sky and does not know where he is from. That is the situation that D.J and Gina find themselves in and they then have to try and find a way of sending him back home. 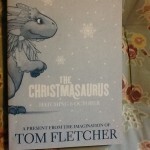 This book is the first in a series of comic style books being published by Puffin. 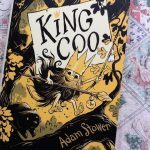 It is bright , well illustrated and full of humour; in other words it is great for boys in particular, although the strong female character makes it fun for everyone. 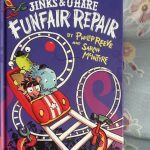 “Jinks & O’Hare Funfair Repair” by Philip Reeve and Sarah McIntyre is another one of their fantastically funny collaborations. Set in Funfair Moon it is full of zany aliens, dastardly villains and a clever heroine called Emily. As you would expect this will take you on a ‘roller coaster ride’ of excitement. The illustrations are full of the energy and humour that we have come to expect. It is a great book to read alone or to a class. 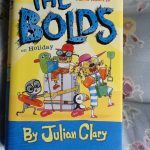 “The Bolds on Holiday” by Julian Clary and David Roberts. Once again we enjoy the company of the Bolds, a family of hyenas who are living in Teddington, disguised as humans. This book sees them and their friends going to Cornwall on their summer holidays. As usual there are lots of ‘groan worthy’ jokes as well as puns, both written and visual. I love the way that the author’s voice comes across so easily and the illustrator’s ability to translate all of this visually. A really great read for all ages. 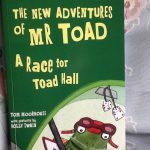 “A Race for Toad Hall” by Tom Moorhouse and Holly Swain is a wonderful update on “The Wind in the Willows”. When Teejay, Mo and Ratty find an old Toad frozen solid in the ice house, little did they guess that it was the (in)famous Toad that they had heard stories of from their grandparents. Toad of course is just as excitable as in the past and when he finds that the weasels have taken over Toad Hall and want to knock it down for a housing estate, he is determined to get it back. With the help of his new young friends he finds a way to challenge the weasels. This is a great story full of charm and humour that really retains the spirit of the original and this is captured by the super illustrations by Holly Swain. I have been taking teachers and librarians up to Birmingham for the last 12 years or so. 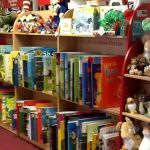 As far as choosing children’s books is concerned Peters, the library supplier, is possible the centre of the Universe and the magical thing is that you actually get to pick the books off the shelves. Over the long time that I have been visiting, things have changed a great deal. 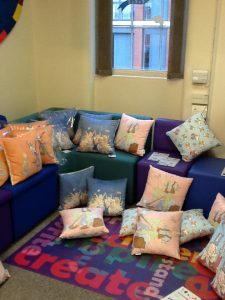 There are new sections, a stronger emphasis on schools and an ever growing collection of furniture and soft furnishings. 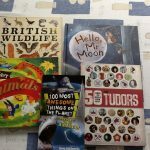 Whilst most of my time on a visit is spent helping the schools, I do get time to look at what has been arriving in the last few months and these are some of the picture books that caught my eye when I visited three weeks ago. 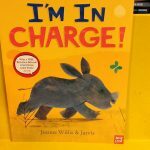 “I’m in Charge” by Jeanne Willis and Jarvis is the story of a young Rhino and how he learns some lessons about sharing and friendship. As always the brilliant Jeanne Willis brings some very relevant words of wisdom to the book. 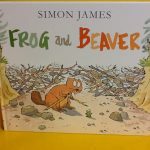 “Frog and Beaver” by Simon James is a funny story with a serious underlying message. 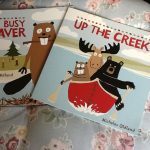 Beaver is so busy creating his own environment that he does not see how he is spoiling it for others; when his dam fails he learns that he needs to work with his friends and neighbours. 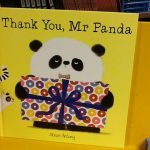 “Thank you, Mr Panda by Steve Antony is yet another wonderful story of the very original Mr Panda. He very kindly gives his friends presents, but without considering of they are suitable; something that we, as humans, should keep in mind. 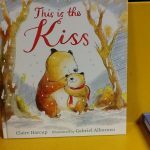 “This is the Kiss” by Claire Harcup and Gabriel Alborozo. 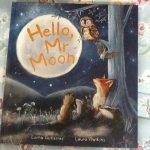 It really is a gorgeous read for the very young and will make bed-time an occasion to be treasured. Definitely one to read to my grandson. 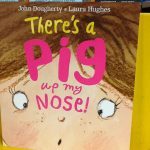 “There’s a Pig up my Nose” by John Dougherty and Laura Hughes gives a very modern twist to the concept of stories such as “There was an old woman who swallowed a fly”. So when Natalie get a pig stuck in her nostril she still has to go to school, where everyone tries to free the pig. A totally whacky story. 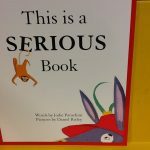 “This is a Serious Book” by Jodie Parachini and Daniel Rieley. This is a wonderful piece of nonsense as the author tries to create a ‘serious book’. However the characters have other ideas and they create complete mayhem as they thwart the author. 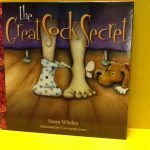 A super story for reading in class. 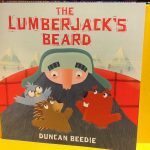 “The Lumberjack’s Beard” by Duncan Beedie reminds me of “The Twits”, only this time the beard is full of creatures that the lumberjack comes across in the course of his work. It is an exuberant and funny story that will be great as a class read, as well as a one to one story. 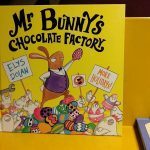 “Mr Bunny’s Chocolate factory” by Elys Dolan. I loved this tale of big business and the exploitation of chickens laying chocolate eggs, it makes me think of “Chicken Run” with chocolate. The illustrations are brilliant and you can spend hours noticing some of the really funny details. What a fantastic story to read for Easter. 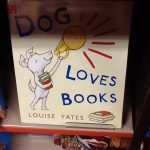 “Dog loves Books” by Louise Yates is about a bookseller dog who is better at loving books that at selling them. However the story is about sharing that love and letting people know that there are books to suit everyone, you just need help in finding them. 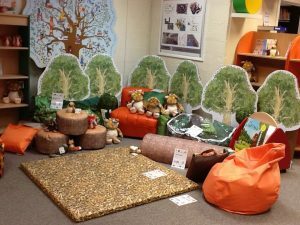 A lovely way to help young children enjoy the book. 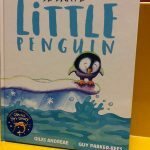 “Be Brave little Penguin” by Giles Andreae and Guy Parker-Rees is the tale of a baby Penguin who is frightened of the water. it is a story about coming to terms with your fears and overcoming them. The joy that Penguin experiences as he meets the challenge will have you cheering out loud. 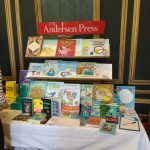 As you can see, I had a great time looking out these fantastic picture books. 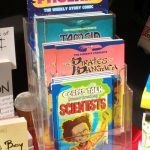 They cover a wide range of topics, but they will all enthrall the young audiences that they are intended for; as well as those adults that are telling the stories. ‘Happy Reading’ to you all. “What on earth is she going on about? What Chickens?” Well in the publishing world this can only mean the fantastic Chicken House Books, founded and run by the amazing Barry Cunningham (yes, he did sign up J K Rowling). 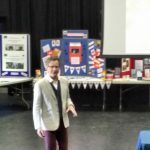 Yesterday I had the great pleasure of attending one of their ‘Big Breakfast’ events, where they present authors and books for the coming year. It was held in central London, in the rather elegant surroundings of Home House (pronounced Hume like the prime minister?) and we were fed with a range of pastries and loads of tea and coffee. 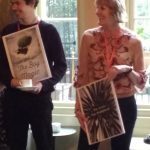 The event started with an introduction to all of the authors and their books, luckily we were given packs with details of these to take home. Although the emphasis was on the first six months of the year, there were several titles that will be coming out in the autumn. We were delighted that so many of the authors were able to attend (I think I counted 10 or 11), however several of the American writers were understandably not there. The highlight of the day was when several of the authors read excerpts from their new works. They were all consummate performers and a far cry from the old days, when writers often found it difficult to communicate in person. “Alice Jones: the Ghost Light” by Sarah Rubin. This is the second in the series about a young amateur sleuth called Alice Jones and I must admit to being a fan. It fits into that group of writers who would be perfectly at home in the “Golden Age” of crime fiction, although these books are set in the current period. A great series for those who love Robin Stevens and Katherine Woodfine. “The White Tower” by Cathryn Constable is a new title by the author of “Wolf Princess”. It is describes as “Magic realism” by the publicity and is definitely one that is on my TBR list. “Mafiosa” by Catherine Doyle is aimed at the older teen and is the climax of the “Blood for Blood” trilogy. Those who enjoyed the preceding novels “Vendetta” and “Inferno” will no doubt devour this latest offering and also those who like a gritty and powerful take on their thrillers. “The Secret Keepers” by Trenton Lee Stewart. this is the start of a new series by the author of “The Mysterious Benedict Society” and it will be loved by those who like their fantasy/mystery to include a little bit of ‘playing with time’. A watch that can make you invisible for 15 minutes could be very useful, but villains chasing after you are less welcome. I am really looking forward to reading this in the next few weeks. “Who Let the Gods out” by Maz Evans is a debut novel and features the Gods of Olympus, but not perhaps at their best. I have been looking forward to this for several months now and have started reading it, so no doubt a fuller comment will be added later. 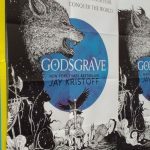 Since ‘Percy Jackson’ we have seen many authors writing about the various pantheons of gods and I think this may well be up there with the other really good ones. “The Elephant Thief” by Jane Kerr is due out in March and is a historical novel set in the Victorian period. When you mix a lonely young urchin with a circus elephant and then send them on a journey it is likely that all kinds of adventures will happen. This sounds like a book with a warm glow to it. “Moondust” by Gemma Fowler is one of the sci-fi thrillers that seem to be making a splash at the moment. It is all about mining for a new energy source on the Moon and has strong themes about the environment as well as about the joys and perils of being a teenager. 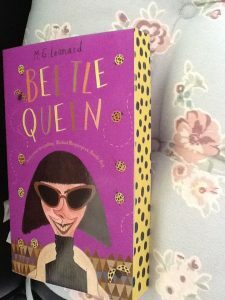 “Beetle Queen” by M G Leonard. this is the second in her “Beetle Boy” series and is due out in April. 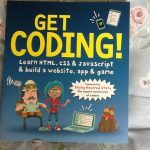 I was very lucky last year and tool the author out to several schools. She was tremendous and the original “Beetle Boy” has seen huge success with lots of award nominations. I can’t wait to read more about the female villain that makes Cruella de Ville look like a cuddly kitten. “Bigfoot, Tobin and Me” by Melissa Savage. We are having to wait until May for this story, but from what I have seen, it will be well worth the wait. 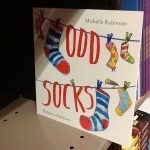 Aimed at the 9+ age group it is about dealing with grief, and since the author is a paediatric grief therapist it is safe to assume that she knows her subject. This is one I am really looking forward to. “The Island at the end of Everything” by Kiran Millwood Hargrave is a story of a young girl living with her mother on the leper colony of Culion Island. When all healthy people are evicted from the island, Ami decides to try and return so that she can see her mother before she dies. I get the feeling that you should not be reading this on public transport due to the “Heartbreaking” parts of the story. 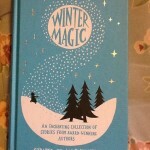 “The Boy who went Magic” by A P Winter is described in the publicity as “being perfect for fans of Eoin Colfer”. It is a fantasy, with just a hint of Steam punk (judging by the picture), so I think I am really going to enjoy this one. It is aimed at what is now called ‘Middle Grade’, so the 10+ age range and will make a great summer read. “The Crash” by Lisa Drakeford, which is aimed at the teen market and involves the aftermath of a car smashing in to the sitting room of a house. “Witch Alone” by James Nicol is the follow up to the very successful “Apprentice Witch”, so this is bound to be another huge hit. “Secret Cooking Club: Confetti and cake” by Laurel Remington is the second in this series and I am very hopeful that it will live up to the high standards of the first book. 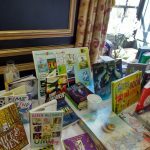 As you can see, we were spoilt with all the amazing authors and books that were presented at the big breakfast and I am going to have a lot of reading in the coming year. I hope that you will find some titles that will suit you, or the young people you work with. 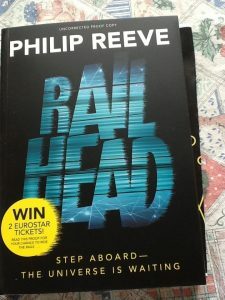 Well, for the last couple of months we have been showered by lists of books that we should be reading this Christmas and I thought that as in previous years I will pick a few of the ones that I have really enjoyed. 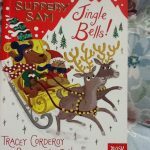 Yet again it has been quite a bumper year for Christmas stories and this year they cover a large range of genres as well as age ranges. So let us start with those for what is now termed the ‘independent’ reader. 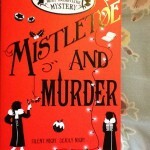 “Mistletoe and Murder” by Robin Stevens is the latest in her series about the two young sleuths Daisy Wells and Hazel Wong. I have been an avid reader of all her works and this definitely lives up to the superb standard of the others. Daisy and Hazel find themselves spending Christmas in a Cambridge college and then they become embroiled in a murder enquiry which really tests their skills. Robin Stevens has used her love of ‘Golden Age’ crime to link this story to the works of Dorothy L Sayers and in particular to ‘Gaudy Night’ which is set in an Oxford College. As the girls might say, this is a “really spiffing read”. 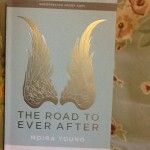 “The Road to Ever After” by Moira Young is a total change from her earlier work and is for a slightly younger audience. It is the story of young Davy David who scrapes out a living in the small town of Brownvale and re-creates pictures of angels on the ground. Life changes when the mysterious Miss Flint hires him to driver her to an unknown house on the coast, despite the fact that he is only 13 years and cannot drive. What follows is a magical journey, with unexpected consequences. There is a sense of being on a quest as well as there being a nod in the direction of “A Wonderful Life”. This is a story to re-read and treasure and I know it will be with me for a long time. 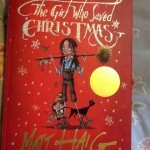 “The Girl who saved Christmas” by Matt Haig is the follow on to last year’s best seller “A Boy called Christmas”. Whilst the central character is still Father Christmas, this book is set at a later period. People are beginning to not believe in Father Christmas and the magic is starting to disappear. It needs someone who really believes, to save the day; but even she is beginning to have doubts. 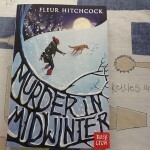 “Murder in Midwinter” by Fleur Hitchcock. When Maya thinks she might have seen a murderer, the police send her to stay with her aunt in Wales. But the danger follows her in this exciting story. 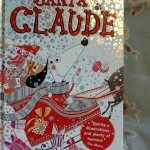 “Santa Claude” by Alex T. Smith. When Claude accidentally locks Santa in handcuffs and can’t find the key (don’t ask) he faces the problem of trying to deliver all of the presents himself. This is a great story for those who are just beginning to read by themselves or who want to share with others. 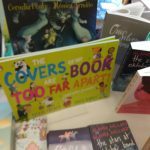 With picture books we are always inundated by a host of new titles every year, however there are also some favourites that make a welcome re-appearance. I have included some that have come back this year and which I have not written about on previous years. “Click Clack Ho! Ho! 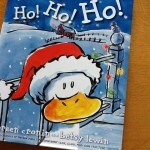 Ho!” by Doreen Cronin and Betsy Lewin. This is the Christmas offering about the animals on farmer Brown’s farm and how they ‘cope’ with Christmas Eve and the arrival of Santa. As usual it is extremely funny and will be a great read. 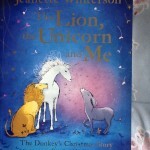 “The Lion, the Unicorn and Me” by Jeanette Winterson and Rosalind MacCurrach. This is a truly beautiful rendering of the Christmas story which really touches the heart. A absolute classic of the future. 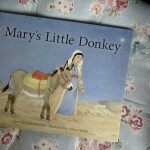 “Mary’s Little Donkey” by Gunhild Sehlin and Helene Muller. This is a story of the Nativity for younger Children. It is translated from the Swedish and then it has been abridged. The illustrations are sympathetic to the tale and evoke the feel of the occasion. A lovely version to read to young children. 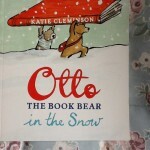 “Otto the Book Bear in the Snow” by Katie Cleminson is the magical story of two book bears whose book is borrowed from the library and then left whilst the readers go on holiday. But the bears need to get back to the library for the Christmas party, unfortunately things do not go as planned, so will they get back in time? 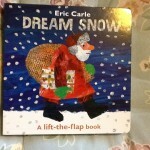 “Dream Snow” by Eric Carle. 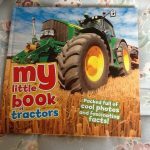 A delicious little lift the flap book about preparing for Christmas on a farm. It is great for recognizing the animals and getting into the festive spirit. 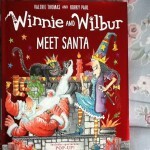 “Winnie and Wilbur meet Santa” by Valerie Thomas and Korky Paul. When Santa gets stuck in Winnie’s chimney he asks her and Wilbur to help him deliver the rest of the presents. They have a great adventure but also lots of problems, so in the end Winnie uses a bit of magic to make sure that all the presents are delivered. As always the illustrations are sumptuous and this time there is a pop-up at the back, which is sure to be a great hit with everyone. I particularly like the use of Greek for names etc in the pictures, I wonder how many children will recognize the language? 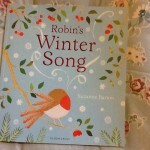 “Robin’s Winter Song” by Suzanne Barton is a beautiful story of the Robin discovering Winter for the first time and seeing what a great time he can have with his friends. The illustrations are positively jewel-like and add to the sense of joy and excitement about the time of year. 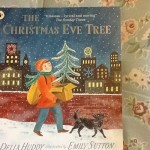 “The Christmas Eve Tree” by Delia Huddy and Emily Sutton is the story of a small and unloved Christmas tree that was saved from destruction by a young homeless boy and of the joy at Christmas as people gather around the tree to sing carols and to forget the problems of their everyday life. The ending shows that there is always hope and we need to believe in the goodness of people around us. There are beautiful illustrations with a feel of the 1960s to them, which really adds to the atmosphere of the story. 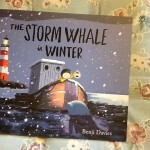 “The Storm Whale in Winter” by Benji Davies is the second story about a young boy called Noi and the young Whale that he had rescued in the summer. This is a winter’s tale and a wonderful coming together of man and nature to save one another. It is a simple but very heart warming story. 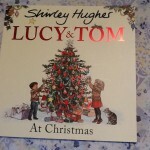 “Lucy and Tom at Christmas” by Shirley Hughes have, together with “Alfie’s Christmas”, become symbols of what we might call a traditional Christmas. It was first published in 1981 and the world has changed a great deal since then. However the story gives a lovely sense of family, friendship and the meaning of the occasion. Sometimes it is nice to wallow in nostalgia and think of the simple enjoyments of life. 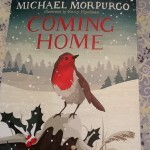 “Coming Home” by Michael Morpurgo and Kerry Hyndman (illust.) is the story of a Robin as he migrates to his winter home, all the time thinking about his partner who should be waiting for him. It is full of trials and tribulations but also kindness and hope. Definitely a story full of the meaning of Christmas. 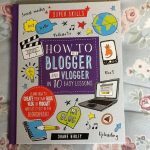 I can’t believe it is only a week until the big day but I am sure that there is still time to do a bit of reading or to get some stocking fillers for the family. I know I will be reading some of these stories to my grandson when he comes to visit and i might even treat myself to a re-read of one or two favourite stories. The Christmas season has definitely started as I was telling Christmas stories in my local primary school last week and I have also been to a performance of Messiah. There is just “The Muppet Christmas Carol” to go and then all will be ready. Have a wonderful Christmas everyone and enjoy your reading.